This popular morning ritual post was also published on Elephant Journal. See the link below. Since my daughter’s birth, I have been shamelessly focused on creating a bedtime ritual that helps my daughter maximize her sleep. I do this not only so I can have some time with my hubby in the evenings, but also because brain research tells us that sleep is good for our bodies and brain. For this reason, I’m dedicated to teaching my daughter positive sleep habits that will benefit her for life. This passion led me to write a bedtime yoga book to help her release her extra energy at nighttime. Thanks to a combination of my focus, her temperament, and probably a dose of good luck, she is generally a great sleeper. However, mornings were not always as blissful as bedtime. It’s no secret that I have struggled as a new mom to our spirited little one. We have very different temperaments, and I have not coped well with her daily screaming tantrums for the past two and a half years. My years of education and child development training seemed to have slipped out of my mind. At times, the tantrums started at 6:30 a.m. and sent us both into a negatively-charged start to the day—not healthy for either of us. Last September, I went away with some girlfriends for two nights. It was my first social weekend away from my family since giving birth. I woke up in the mornings before the others and lay in bed reading a book. It was such a treat. After that weekend, I knew I had to create a morning ritual at home to help both my daughter and I start the day with calm and peace. My mental health depended on it, and I’m sure hers did, too. No iPhone: I now leave my iPhone downstairs and no longer have it charging next to my bed, thus eliminating the temptation to check email first thing in the morning. 15 minutes of meditation: I sit silently for 15 minutes, using my mala beads to count my breath. Twice around the beads is 15 minutes, so I don’t need a timer in my bedroom. Morning cuddles: When my daughter wakes up, we enjoy a few minutes of morning cuddles and chatter. Play calming music: When we come down together for breakfast, I put on a Pandora station (like Kira Willey, Sarah McLachlan, Enya, Wah, or Vivialdi) to create a gentle mood for the day. During my 15 minutes of morning meditation, my daughter is still sleeping, comes in to sit on my lap, or plays quietly in her room, which she never did before this. Regardless of whether she is actually meditating herself, the effects of my meditation practice seem to be radiating throughout the whole house. It’s hard to believe, but our mornings have shifted dramatically. I feel more emotionally-balanced and can once again enjoy a peaceful start to the day. How about you? 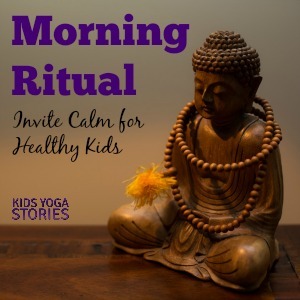 What difference could starting a morning ritual in your household make to your family? What activities could you implement right away that would bring a sense of calm to the busyness of getting up, ready for school, and out the door? What can you do in the morning to set the tone for the day? of “Invite Calm with a Morning Ritual” on Elephant Journal. Download these 57 digital Calming Yoga Cards to learn through movement in your home, classroom, or studio. The deck includes an index card, calming and yoga tips, pose instructions, 24 yoga pose cards, and 24 matching description cards. The illustrations feature multicultural yoga kids are from seven countries. Ages 3+. 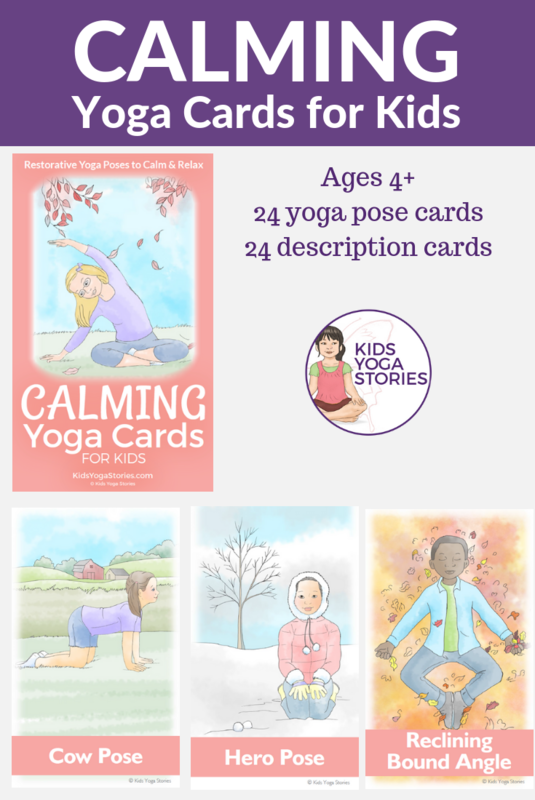 Purchase Calming Yoga Cards for Kids here. 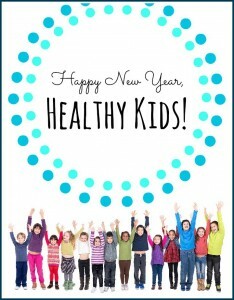 Want to be notified of other yoga tips and kids yoga resources? Sign up for our weekly Kids Yoga Stories Newsletter (put email address into box at the top of the page) to get updates! To inspire mindfulness and meditation practices within your family, I’ve teamed up with several producers of meditation and mindfulness resources to offer you this awesome Meditation for Kids giveaway. Hopefully, these wonderful resources will bring more calm and peace into your home. My reviews of these products can be found on our Meditation for Kids Gift Guide. Amazon affiliate links are below for your convenience. Some of the resources above were given to me free for review, but all opinions are my own. Please read the full Contest Rules below for details. To enter the contest, sign in using your Facebook or e-mail account and click on the different ways to enter. You can enter every day using this Rafflecopter online giveaway tool. 7. Kids Yoga Stories and the other publishers accept no responsibility or liability for any injuries or losses that may result from practicing the suggested meditation and yoga practices. Please ensure your own safety and the safety of the children. 8. You must enter the contest giveaway with a valid e-mail address. The winner will be notified by e-mail, and at that time, we will request a mailing address. The shipping of the book and video can take some time, depending on the winner’s location. Each publisher will ship the books separately and will cover the shipping costs. 10. Your email address will be automatically subscribed to our weekly Kids Yoga Stories newsletter. You can unsubscribe at any time. 11. The contest closes on Monday, January 27th, 2015, midnight EST. I believe these resources would help my young daughter because she finds yoga interesting and she suffers from anxiety. I believe learning to meditate could help her learn to calm some of her fears and I have been looking for resources to help her start. She is very active and has a hard time staying in one place so adult resources are of little help. I have three children ages 7, 8 and 9. We use yoga as part of our weekly centering during fitness class in our homeschool. This would be a wonderful addition. I think a morning practice will launch them into a more graceful, productive, aware day. I love this! I’ve been using mindfulness in my teaching of yoga to the kiddos already and I’m always looking for new tools. Hopefully it will bring an extra calmness to our bedtime routine! I have been looking for a way to add meditation into my daily routine. And, I think adding my daughter into the practice could actually be the way to make it stick! Love the easy to implement suggestions – thanks so much! I’m a full time working mom of 3 kids who all go to different schools/places every morning. My commute to work usually takes an hour and I’m always panicked about leaving the house on time. Our mornings are crazy! Even when I try to be mindful it never seems to work out and the kids and I all end up feel stressed, sad and guilty. I really need a better mommy morning routine and I’d never thought to bring the kids in on this too. What a great idea! What a wonderful opportunity! We love kids yoga, we practice it, and I implement some elements in my baby development classes! My daughter needs down time and I think teaching her some meditation will help all of her anxiety and lifestyle. This is awesome! I just review Kira’s new CD yesterday, we found her music through your blog and I’ve been eternally grateful. Those CDs change the entire mood in our household. I struggle with making a calming morning routine for my little one because we have daycare kids show up at 7am and if left to herself, she’d sleep in until 8:30 or so. If I wake her up early, the whole day is off, if I wait for her to wake up, it’s a dice throw if she’s upset or excited to find friends in her house, and again hit or miss if I can stop what I’m doing to have a couple of minutes for cuddling. My daughter has so much anxiety and I would love to find simple solutions to help! I’ve been wanting to incorporate meditation into my life for a while now. This gives me the extra push. I’m going to work on a quiet corner area this weekend:) My son loves to do yoga with me though! These will be a great way to help my kids learn to center themselves and calm down when upset or before bedtime. My oldest son and I have been trying to work on our self-regulation skills together. These resources would greatly benefit BOTH of us!! I’m really looking forward to implementing a peaceful morning routine, we have similar struggles around here, so it’s something I’ve been thinking about doing for awhile now, thanks for the encouragement! My younger daughter has been having trouble with anxiety and I have been meditating with her and picking a word of the day in the morning before school. I would love to try some new techniques. I also teach yoga to toddlers and preschoolers and I am always looking for new things to share with them and their parents/caregivers. Thank you! I use yoga to prepare Occupational Therapy students for their session as well as working on OT and other goals. I have several of the above books or make my own or use cards. They love it and need it!! Iwould like to expand the use of yoga in schools. 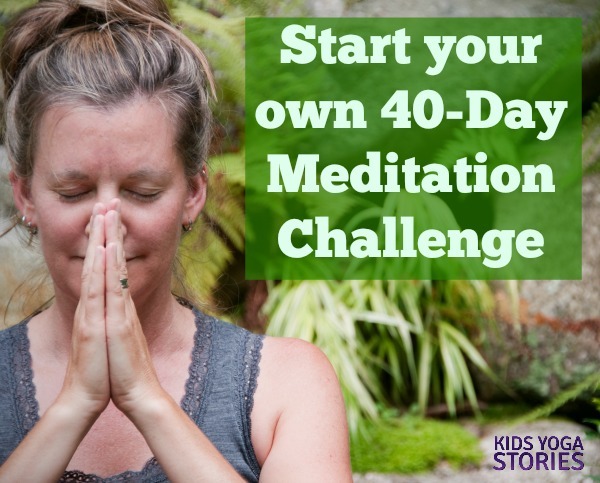 I’ve been looking for ways to incorporate meditation into my children’s lives. Great post, and thanks for the giveaway! I think this would help my son a lot. He’s been having trouble at school with his behavior, talking too much… i think if he learned to meditate and stay calm it would really help with during school. I think this will help my daughter control her adhd. I am a foster/adoptive mom of six. My children have mild to moderate special needs and I cannot even begin to tell you what a difference yoga and meditation have made in our lives to help calm the chaos! I love this and am sharing it on various social media sites as I know so many other moms who would benefit from this and/or appreciate the reminder. In the New Year, I’ve been focusing on getting up before my boys, but mainly so that I could get some work done before they wake instead of juggling email check-ins with their morning routine. Your post reminds me that the morning will go so much more smoothly if, before diving into work, I center myself and prepare myself for a positive day. Thank you. I am an elementary teacher and Ashtanga Yoga teacher. To ensure my students acquire 1 additional hour of daily physical activity a day, I have incorporated meditation and yoga into our curriculum. For example., for poetry we do a lot if meditation, visualization and write poetry. Students celebrate and demonstrate their knowledge with a morning of Mother’s Day yoga tea and poetry. I have an extensive collection of yoga stories but anm ALWAYS on the search for new resources. To inspire and educate my awesome first graders! My son is very high strung and is probably on the autistic spectrum. He has a very difficult time with transitions and change so these tools will help him to self soothe when he is feeling stressed. I am a “young” grandma to a 2 year old grand daughter. This would be a wonderful addition to our everyday patient practice and our quiet times. We have already started yoga with easier movements and poses. We have a great time together, what an awesome way to entertain a 2 year old! She also likes to practice Tia Chi, all of these are an incredible benefit to her motor coordination and direction skills. I enjoy your blog immensely. This is a fantastic giveaway. Thank you so much for this opportunity. What an amazing group of resources for helping kids find their calm in a crazy and busy world. 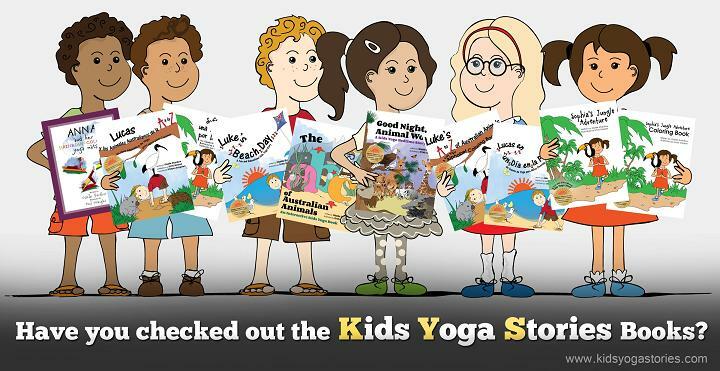 We love the books that we have already from Kids Yoga Stories and are always looking for new resources. I would love to help expand my daughter’s yoga practice. This would make an awesome birthday present for her 5th birthday! I think that it would bring a little more calm into our day. Thank you for doing this contest. My two year old has grown up with mommy and daddy working out. Yoga is one of his favorite activities. It is so good for him. I want to learn more so I can teach him more. Winning this contest would help tremendously! I teach kids yoga and we are working to introduce meditation to them. The books will be a great help! Love yoga- I need to start doing it more regularly. I have moment quiet time where I pray and focus for the day. So encouraging- thanks for sharing this with the link party! What you’re describing is very similar to the morning rhythm we follow as part of Waldorf education. It has made a tremendous difference to how my hot-tempered youngest child and I spend our entire day. Thanks so much for sharing at the Natural Living Link-Up – hope to see you again next week! My kids are 4 and 7. Is this a good age to start morning Yoga?